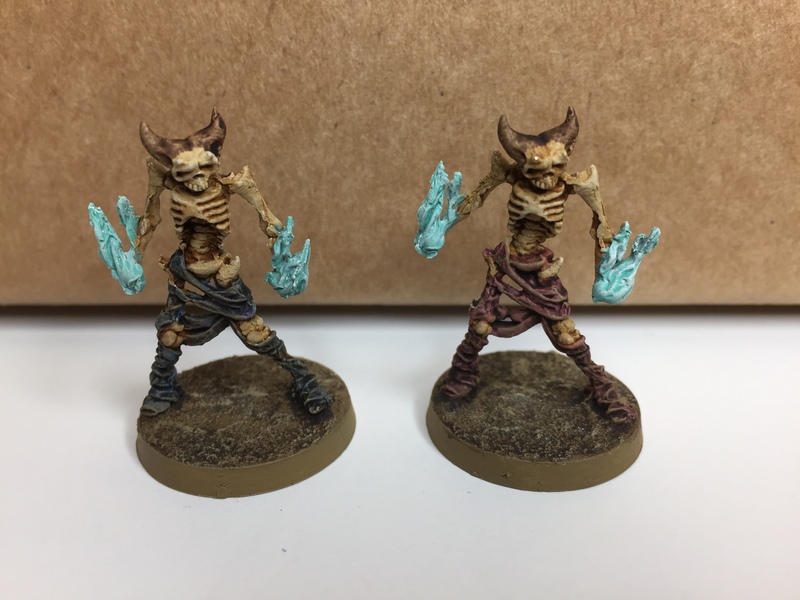 Speed painting challenge… OF DEATH!!!!! 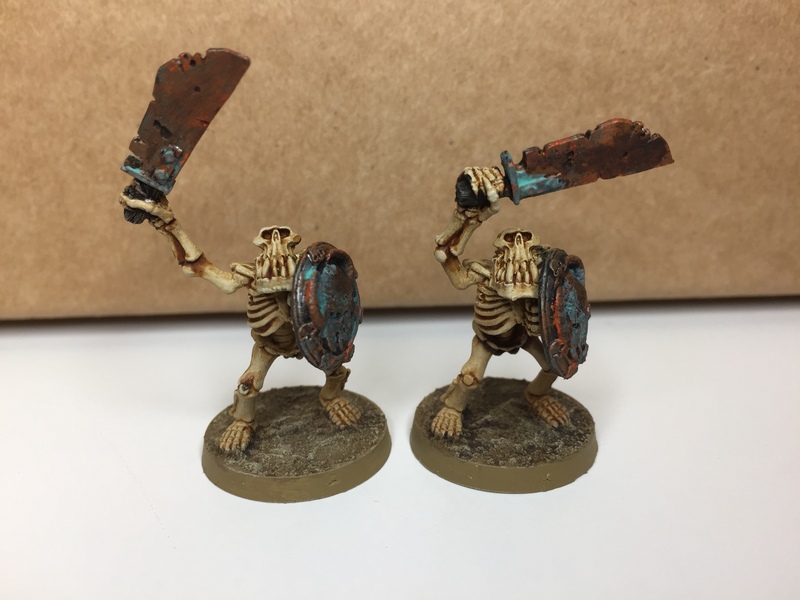 Now, by Friday, I had the vast majority of my dissertation written, and with time in hand, I decided to treat myself to a pleasant Saturday evening of AoS with my Brother-in-Lead Ross, who has one of the most awesome collection of OldHammer Daemons you are likely to see anywhere. He ‘let slip’ that he was going to run a Great Unclean One in a 1000 pt. 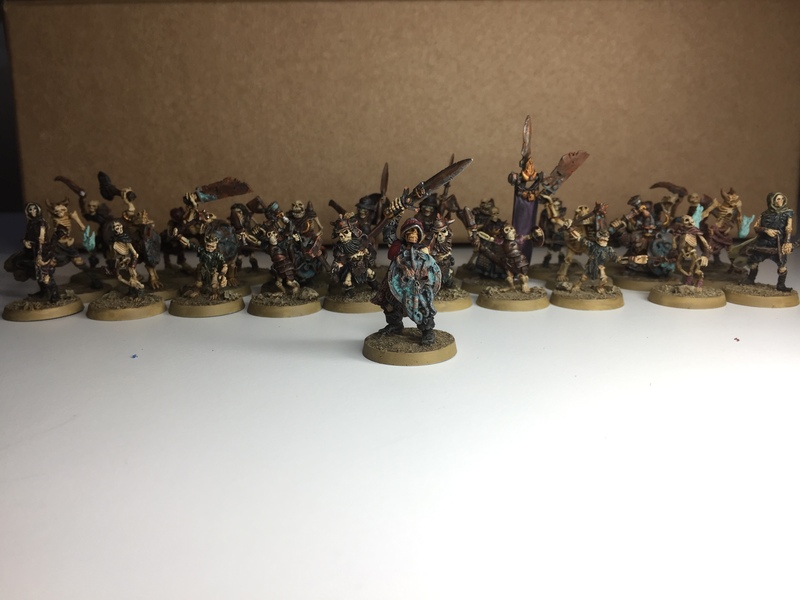 list, and that caused a bit of panic, because I didn’t have anything like enough painted lead to match that… thus ensued a speed painting session of legendary proportions! Spirit hosts or banshees perhaps? 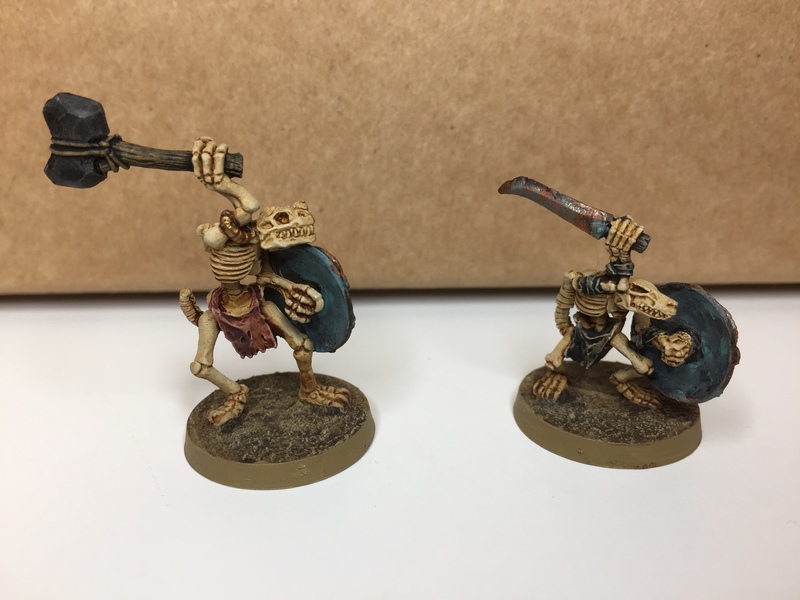 Ok, so they are a bit rough and ready – I need to go back and highlight the bone on Saturday’s output and finish the Cursed Company banner, but they are certainly good enough for table-top I reckon, and hell – 35 completed minis in 21 hours is pretty incredible, right? So why the mad rush? 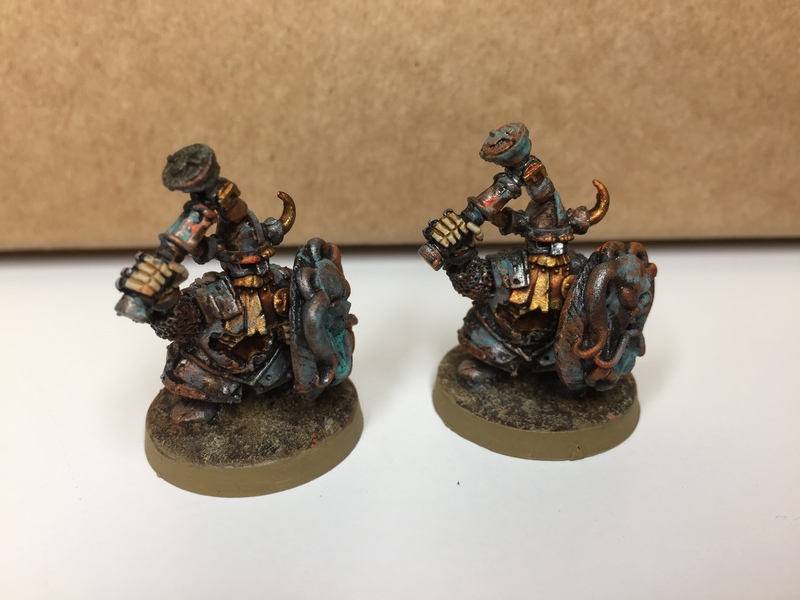 Well, partly it was two weeks of pent-up painting frustration, but mostly it was the result of the arms race mechanic of AoS… Allow me to explain. 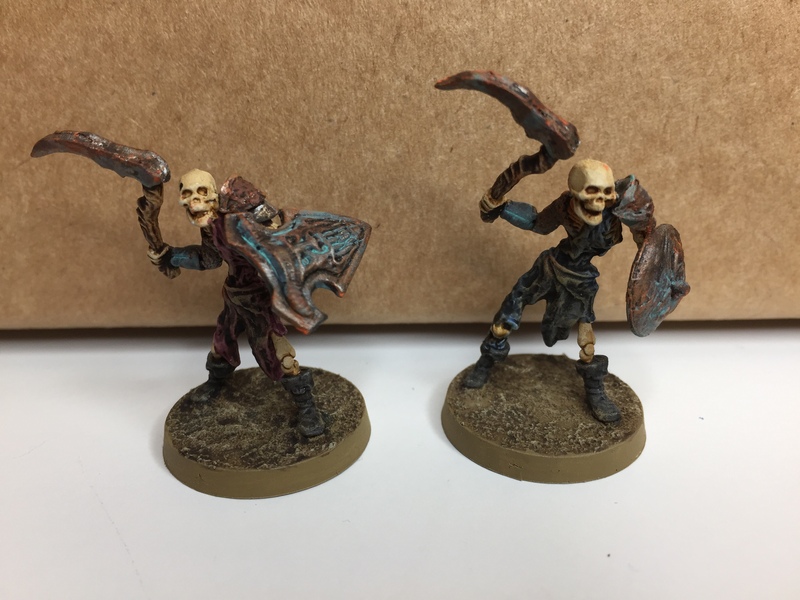 In AoS, 10 Skellies gives you 10 attacks per turn, hitting on 4+ and wounding on 4+… Pretty naff, right? 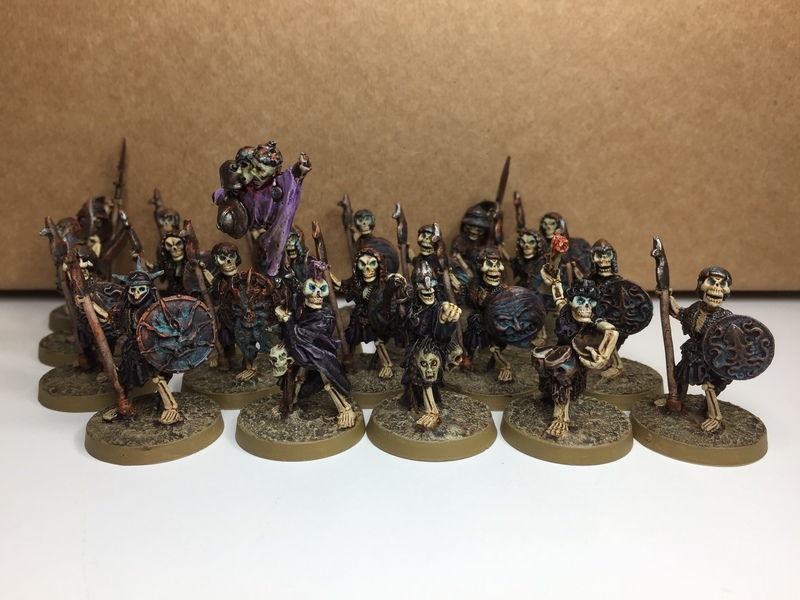 But wait – add another 10 skellies to the unit and you get a bonus +1 attack per model for a total of 40 attacks, (base 20 + bonus 20), while 30 figures gives you an additional +1 bonus per model for a total of 90 attacks (base 30 + bonus 60)… trebling the model count makes the unit 9 times hittier! 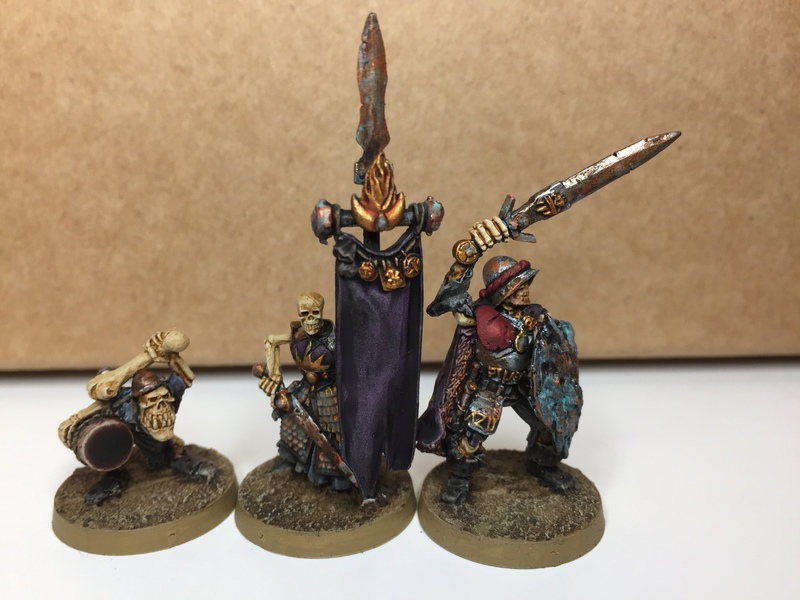 Add in a command squad, (for no cost), and the champion gets you an extra attack, the musician gives a guaranteed minimum 6” charge, and the banner/icon bearer allows you regenerate D6 models each hero phase… Suddenly these chumps are looking a bit more serious! 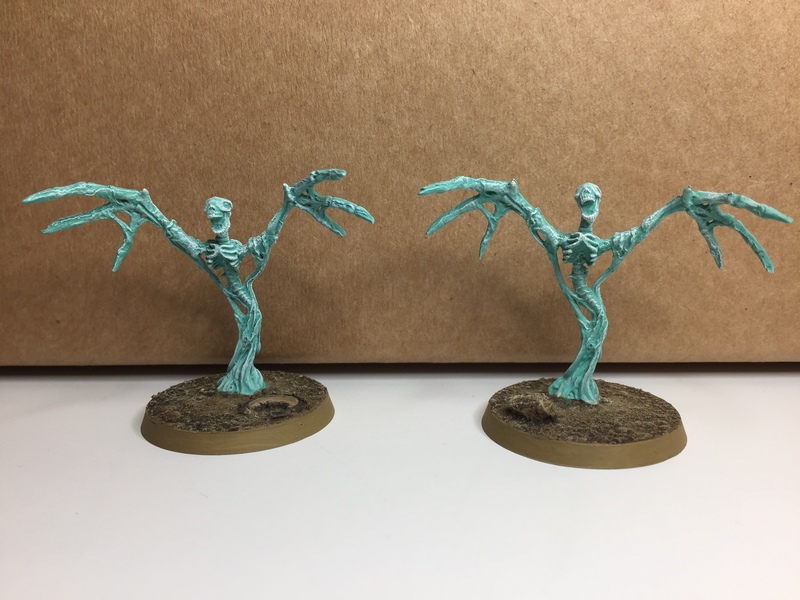 But that’s not all folks – if you have a Wight King within 18”, he can use his ‘Lord of Bones’ command ability to grant the unit an additional attack per turn, so that puts our 30-strong unit of humble skellies up to a whopping 120 attacks (or 121 with the champion). But that still isn’t all! Add in a Necromancer with ‘Vanhels’s Danse Macabre’, and you get to do it all again in the same combat round! Phew! 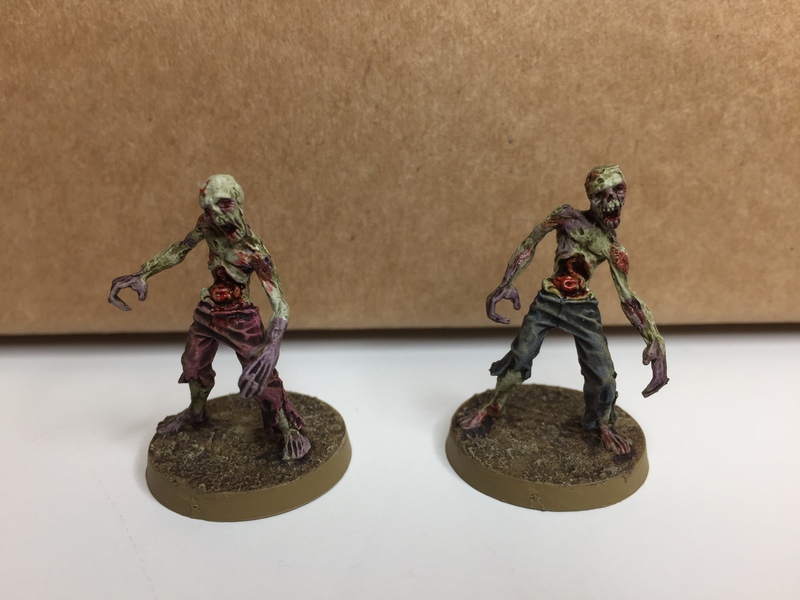 A maximum 242 attacks, which due to the power of mathematics should equate to 60.5 wounds… Enough to deal with a Great Unclean One? You betcha… last night saw a very rare victory for team Leadballoony and the forces of (un)death! 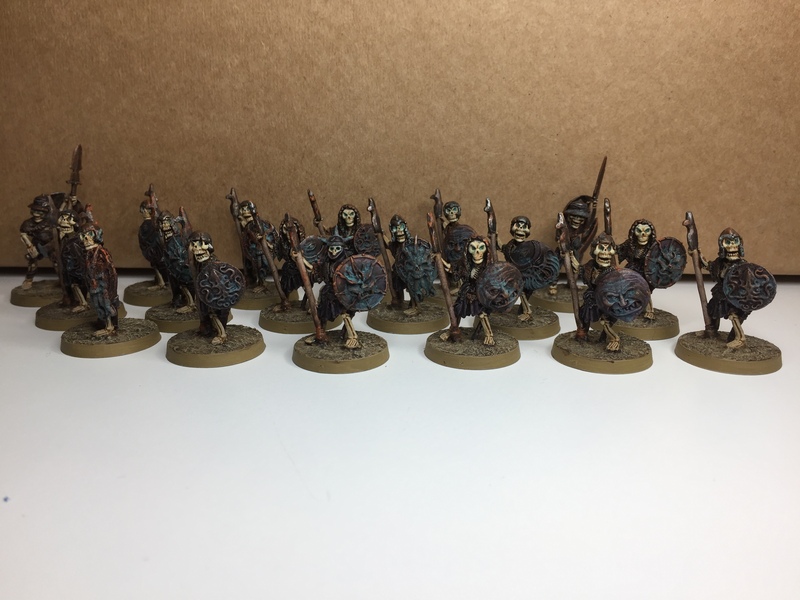 I think I’m getting a feel for AoS – it kind of feels like a computer game, where buffs and debuffs are king, and getting the army balance right is really important. Big heroes and monsters have their place, but massed ranks with stacking bonuses are pretty powerful, and your big beasties need to pick their battles carefully. I’m starting to enjoy it as a system, and I am quite looking forward to the skirmish version that is due out soon. Everything looks cool! All the best with the dissertation! 35 models in 21 weeks is more my tempo, if I rush it that is. Great job mate. Good luck with the dissertation. One heck of a feat! Great stuff on both the minis and the dissertation, congrats on both! Great stuff! And disturbingly productive for a single day’s painting! Hey, thanks man, and likewise yours – that’s a hell of a story!